Home / Jewellery Scale / Weighing Is Important In Every Industry! Weighing Is Important In Every Industry! Have you ever thought about which all places where weighing scales are used.... There are ample of places weighing scales matter. Some are very common and we all know them like the normal weighing scale that measure human body weight is always found in every house and at various different places like Hospitals and gym. Yes these are different from the normal weighing machine that are available in the market which we use. There are many company that are very good and are jewellery scale manufacturers and have been in the industry for years now catering the world of jewellery industry with amazing jewellery scales. 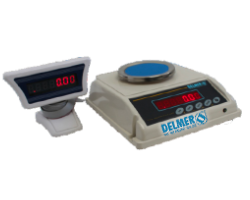 Delmer India is a company that is into manufacturing of different digital weighing scale for more than two decades now and we are very much known company in the industry of electronic weighing scales. With experience of all these years developing digital weighing scales they bring out some of them Technology based electronic weighing scales that can be used at various different places. They also known Jewellery scale manufacturers in the jewellery industry as jewellery is about dealing with precious metals and precious stones at most of the times and that is a reason one needs perfectly accurate digital weighing machine and that is a reason a Jeweller will always choose a Jewellery scale manufacturers very cautiously. In jewellery industry is very important to have accurate weighing scales as they are used for various different purposes right from weighing the gold to weighing the gems and need no mistakes. As even a small mistake can cause a lot to the Jewellers.